Trade Show Magician Doug Anderson is a professional "people stopper". Your company won't realize the full potential of literally thousands of prospective customers attending your next trade show unless... you can get them to stay for even just a couple of minutes at your booth. Remember: you have to stop them before you can sell them. With award-winning trade shows magician Doug Anderson in action on the trade show floor, you can have maximum attendance at your next exhibit! Doug Anderson will weave your product message in with his tried-and-true sleight-of-hand magic. At the end of each 6-10 minute routine the attendees will have just heard your company message in a positive manner. With the ice now broken they are in a more receptive frame of mind and your sales reps can go to work qualifying prospects. This happens 2-4 times per hour, each and every hour the show is open. 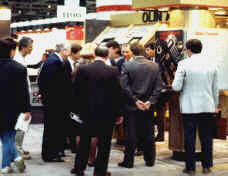 Think back to your last trade show. Remember seeing sales reps from other companies just kind of hanging around, talking with each other? Now, if you've seen Doug Anderson performing at a trade show exhibit, you'll have seen everyone, including the competitors watching Doug and the company he's representing. With hundreds and sometimes thousands of exhibitors at any given trade show, how is your company going to stand out from the competition? How are you going to reach the maximum number of people, give them product knowledge and leave them with a lasting, positive impression? Award-winning Comedy Magician Doug Anderson!